West Virginia Global Volunteer, Janet, reflects on her work with children and youth in Appalachia. 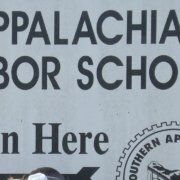 I can speak for all of us here at Global Volunteers on this week’s projects: We adore the kids we’ve gotten to know and admire the adults in this Appalachian community who work with SALS. Sunshine, morning dew and fog along the mountaintops greet us each day as we leave our tucked away home of Beards Fork. We drive up and down highway 61 delivering our team in a ’96 van with 250, 000 miles. It does the job even on the curvy section of the road where there’s a drop off on the right due to recent flooding damage. We head to Oak Hill to work with YouthBuild guys and gals ages 18-25 on projects from house building, to sorting donated food, to making lunches for local children, to gardening. The other part of our team remains at the school in the tiny village of Beards Fork to work with children 6-12, usually reading and recess. And in the garden as well as caring for the ducks, chickens and a pig named George. What a fantastic opportunity to be a part of the community — one week is just not enough!